1. My son turned two earlier this week and we had a family party last weekend. These pretties brightened up our entry way and they're still looking gorgeous. I love carnations. 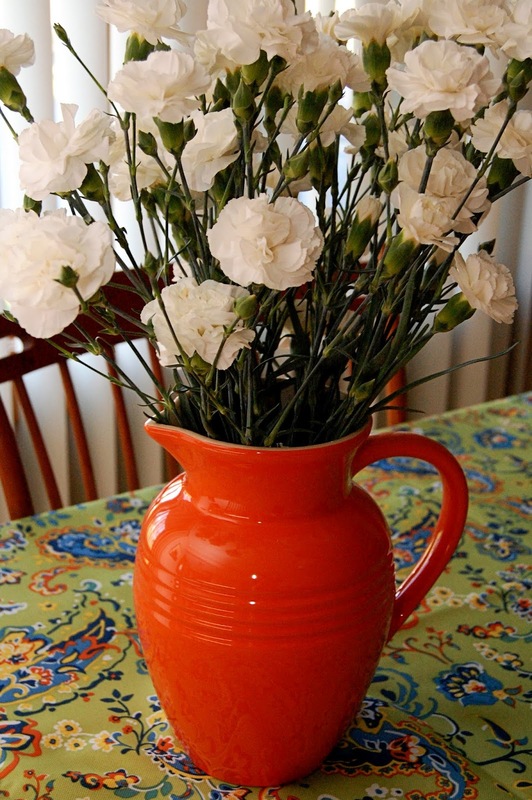 The vase is a $10 Marshalls find--a Le Creuset pitcher. I found this tablecloth there the same day--it's made of a wipeable indoor-outdoor fabric that I'm hoping will be both durable and easy to clean. Discounted table coverings 120" long are hard to come by, so I snatched this up when I saw it. I couldn't find this particular color online, but the aqua is also gorgeous. I'm a big paisley fan. 2. Little boy's birthday cake? Last year's Sugar Free Banana Cake is this site's most searched for recipe. 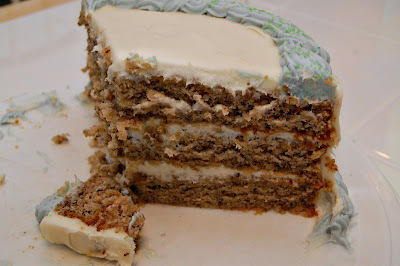 But since my son's palate is now more widely developed, we went ahead and let the kid have some sugar this time around in the form of 3 layers of cream cheese frosting. :) I followed the recipe for Best Ever Banana Cake (nearly 1000 positive reviews can't be wrong, right? ), adding 1 tsp. cinnamon and 1/4 tsp. allspice, and also dividing the batter between 3 9" pans. The blue frosting is flavored with blueberry--an unexpected and tasty complement. 3. This mix has become my favorite "convenience" grocery item. We are eating so many more salads since I started buying these boxes of pre-washed greens--plus a lot more spinach, which is so good for us. Soon we'll be adding some fresh garden lettuces as well! 4. After entertaining last weekend I've been a little lazy about dinners this week, but we still had about 1 loaf's worth of 5-minute artisan bread with thyme & rosemary left in the fridge, so I rolled it out and plopped it down in our 14" cast iron pan, the bottom of which I sprinkled with cornmeal first for easier release. Topped with our favorite pizza toppings and baked for about 20 minutes at 400 degrees F, it was a delicious way to use up that extra dough. 5. I just finished reading The Book of the Dun Cow by Walter Wangerin last night. I first heard of it via Justin Taylor, and having read and loved one of the other books on the list already--Peace Like a River, one of my all-time favorite reads--I added Dun Cow to my list. I got through it in 3 evenings. It is gripping, and not quite like anything else I've ever read. It's part epic beast fable, part parable...there are Biblical forms and elements of allegory, but you just have to read it to understand. It's been compared to The Lord of the Rings, Watership Down, and The Chronicles of Narnia...with good reason, I think. There are some truly wonderful passages depicting the war against self & sin. I can't wait to get to the sequel, The Book of Sorrows. 6. I read Longitude by Dava Sobel probably 6 months back but since I'm talking about books now, here we go. It caught my eye at a library book sale, and I found it fascinating to read. The "longitude problem" plagued sailors and scientists for centuries. The book jacket says, "Lacking the ability to measure their longitude, sailors throughout the great ages of exploration had been literally lost at sea as soon as they lost sight of the land. Thousands of lives, and the increasing fortunes of nations, hung on a resolution." In 1714 England's parliament offered the modern equivalent of $12 million to anyone who could successfully solve the longitude problem with a device or method. The book then chronicles how one man, John Harrison, something of a reclusive genius, spent 40 years inventing and constructing the perfect marine chronometer. I don't remember if Harrison ever recognized God's help in his task (though many men of his day had some form of faith), but reading in the 21st century I can praise Him for giving intelligence and persistence to people throughout history, His common grace. I would have never come. I would have never loved. wouldn't touch the dirt within. would not have been my plan. He alone did not deserve. I have a small loaf's worth of artisan bread dough to use up too - hadn't thought of using it in a cast iron pan. Thanks for the tip!